We continue to get emails concerning USCG issued Captain’s Licenses. Some of these inquiries pose the question, do I need one, while others are curious as to what it takes to get one. A “passenger for hire” means a passenger for whom consideration is contributed as a condition of carriage on the vessel, whether directly or indirectly flowing to the owner, charterer, operator, agent, or any other person having an interest in the vessel. Section 2101 of title 46 (5a) defines “consideration” as an economic benefit, inducement, right, or profit including pecuniary (fancy attorney word for money) payment accruing to an individual, person, or entity, but not including a voluntary sharing of the actual expenses of the voyage, by monetary contribution or donation of fuel, food, beverage, or other supplies.” Additionally, employees or business clients that have not contributed for their carriage, and are carried for morale or entertainment purposes, are not considered as an exchange of consideration. 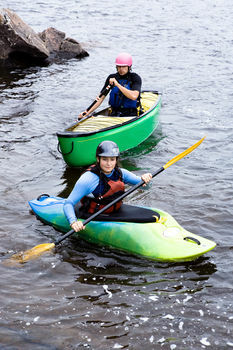 Bottom line: If you are a recreational boater, you are allowed to share expenses for a day on the water. Just don’t make payment mandatory if someone wants a boat ride. This question takes me back to the time 20 years ago when I sat for my first Captain’s License. I went to the Miami Regional Examination Center (REC) for the testing. As I recall there were approximately 25 people who showed up at 0800 to “get” their Captain’s license. Some of these people had been boating for years and thought the process would be simple. Some didn’t even know that there would be testing involved. At the end of the testing period there were only 4 people who completed all the testing modules. Of those only 2 passed, one of those was me. The Coast Guard doesn’t require boat ownership as a prerequisite for a license, but they do require that applicants document at least 360 days of sea service on the water for an entry-level, or Operator of Uninspected Passenger Vessel (OUPV) formerly known as the “6-pack,” license. A “day” would be a trip of at least four hours. Of the 360 required days, 90 must have been within the last three years. If you do own a boat you can self document the time spent on that boat. With the exception of the OUPV, all applicants must be U.S. citizens and at least 18 years old. They must have current first aid and CPR certificates and either be enrolled in an approved random drug testing program or have recently passed a chemical drug test. Applicants must also see a doctor for a physical exam and have a Transportation Workers Identification Credential before they will qualify for a license. Higher-grade licenses have additional requirements, but those are the primary qualifications and hoops someone must jump through before they can get a basic Captain’s license. To qualify for a license applicants must also pass a written battery of Coast Guard exam modules testing their knowledge and understanding of rules and regulations, first aid, navigation, boat handling, weather, marlinespike, and a whole list of other topics on general seamanship. Usually taking four to five hours to complete, the exam modules are not easy but they are certainly effective at weeding out people who haven’t learned what the Coast Guard feels they should know. Even though someone with decades of experience on the water might get upset that the Coast Guard doesn’t make it easier for them to get a license, I’m sure most would agree that, if only for public safety, the bar needs to be kept high. The experience of owning a boat and running it to and from the local fishing grounds is a good start, but it doesn’t necessarily mean someone has what it takes to safely take inexperienced passengers out on the water where so many things can go wrong. 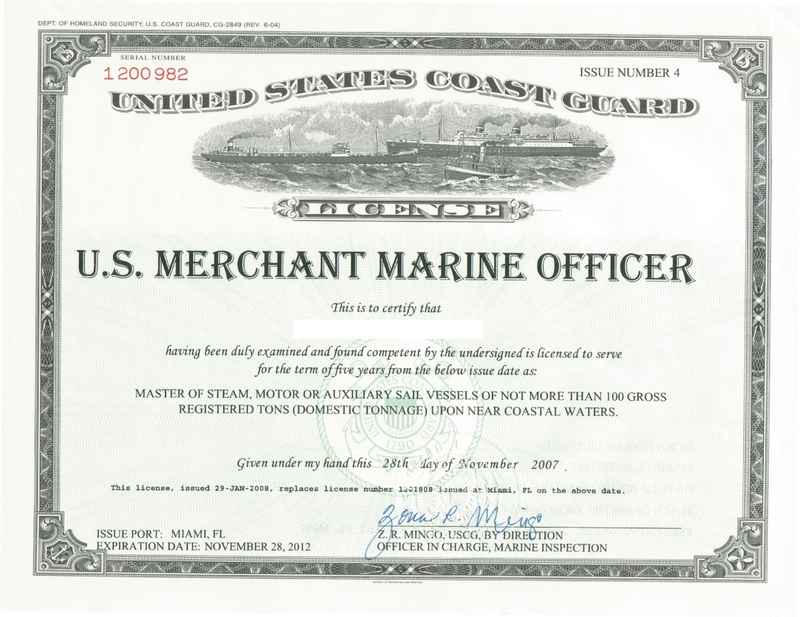 For additional information on USCG Licensing visit the USCG National Maritime Center for requirements for the various levels of license, applications and further instructions. It appears to have been the world’s shortest sea trial for the car carrier DYVI PACIFIC. The ship apparently capsized shortly after leaving the builders yard in Shadong, China on 23 April 2009. The 6,200 car capacity (ceu) ship had just been recently christened at a ceremony on March 16, 2009 at Samjin Shipbuilding Industries. The ship was departing for trials and was scheduled to be delivered to its owners. Photos show the sad state the ship is in now, and also indicate that the yard probably painted only one side of the ship for the naming ceremony. A report from Tradewinds says that the ship struck rocks near the yard during trials, causing the capsizing. More photos at Maritime Blog. Read more at Coast Guard News. Now that’s my kind of superyacht and she is for sale. If I were to give up living on land and take up motor-yachting, that’s the boat I’d buy, if only I had the 10.5 million dollars. 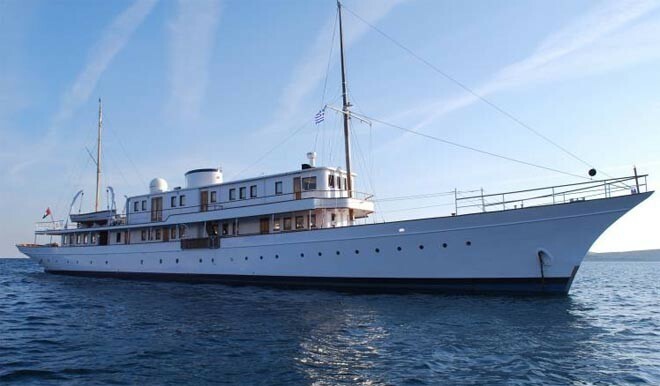 The world’s oldest steel superyacht, Madiz, is still funtioning in style nearly 110 years after she was launched. Not only does she have those beautiful lines but is an elegant lady from stem to stern. She has also had some well known users, including the British Royal Family. At 182 feet she’s nothing as large as the big bullish superyachts of today, but she was built proudly by the Ailsa Shipyard in Troon, Scotland and originally christened the Triton. She even served her country in the British Royal Navy as a Royal Patrol Yacht during World War II, and King George VI, Queen Elizabeth and Queen Elizabeth II used her on several occasions. She is the last surviving ship to have been personally designed by G. L. Watson, the pioneering yacht designer who created some of the most successful contenders for the America’s Cup, but she was refitted and completely restored as recently as 2006. 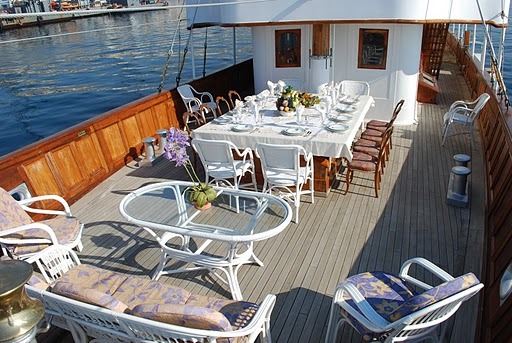 She has decks of Burmese teak, Cuban mahogany in the master staterooms and solid oak paneling in the reception areas. The whole yacht speaks to the luxury of a bygone era, fit for the royals, and just right for me. There are stylish accommodations for 14, along with a crew of 9 to serve champagne and keep the woodwork shining. Speaking of champagne, were is that little guy in the sparkling, white coat? The guests should be here soon for our little lunch on deck. There’s only that little problem of the $10.5 million… but if you are interested, click here to make contact. Below are the specifications to assist in making you comfortable with your new purchase. Increasingly around the country juries are not buying defendants arguments that boating accidents while under the influence of alcohol should somehow be excused because a boat was involved. In two cases reported here, juries deliberated just a couple of hours before turning thumbs down. And then in both cases judges sentenced the convicted boat drivers to long prison vacations. Happy cruising fellas. There have been enough boating tragedies involving drunk boaters, they happen every week in the summertime, all boats need to have a designated driver when returning from a party. Pass the word on. Don't spend your boating vacation here! After deliberating for three hours, a jury last Thursday evening decided a Clearwater, FL man was responsible for the death of a 21-year-old friend who was killed in a boating accident two years ago. A judge immediately sentenced him to 15 years in prison. The defendant was on trial on a charge of boating under the influence-manslaughter. Prosecutors said he had a blood alcohol level more than twice the level at which the state presumes impairment when his 16-foot Hydrosport crashed into a boat at anchor on Lake Tarpon. The defendant’s roommate was mauled by the boat’s propeller, which slashed her chest and nearly severed her arm. The roommate died 10 days after the accident. According to prosecutors, the defendant (now convicted) was operating the boat’s throttle as his daughter, who was 10 years old at the time, steered the boat that evening. A jury, also last Thursday, found a Casper Wyoming man guilty of two counts of aggravated assault for his role in a boat accident last spring that left four people seriously injured. The defendant, 31, was also found guilty of boating under the influence. The jury of seven men and five women needed roughly two hours to reach a verdict. The defendant, standing with his attorney, showed no emotion when the announcement was made. The defendant, the boat’s owner, and four other people were aboard the vessel when it struck a Fremont Canyon wall at Alcova Reservoir. Everyone aboard suffered severe injuries. 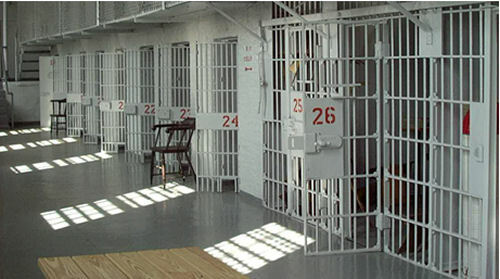 The defendant, an Army veteran, faces more than 20 years behind bars when he is sentenced. The prosecutor began his closing argument by describing how the boating trip began, the group met and were drinking at a Casper car wash before deciding to take the defendant’s boat to the reservoir. They stopped for vodka on the way, the prosecutor said. The prosecutor reiterated to jurors how numerous witnesses testified during the trial about the defendant’s erratic driving of the boat. Witnesses said the boat suffered two malfunctions, an engine problem and the steering wheel came off , on the day of the crash. Both problems were remedied and the boating expedition continued, according to courtroom testimony. The boat, a 23-foot 1979 Excalibur speedboat, was propelled into the air after hitting a wake. After landing, it made an immediate right turn and hit the canyon wall going at least 26 mph. Last Sunday was not only Valentines day but the day that the America’s Cup once again returned to its name sake homeland. 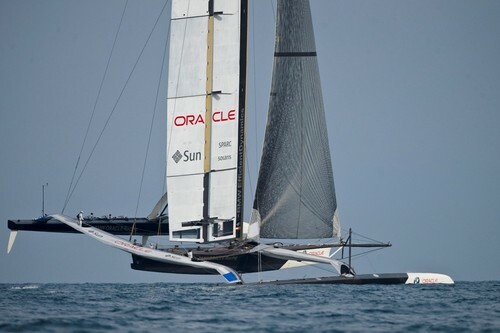 The second successive victory for BMW ORACLE Racing team against the Swiss Alinghi team on Sunday February 14th 2010 marked the end of the 33rd America’s Cup in Valencia, Spain. It all came down to a couple of errors on the part of the Alinghi team including a penalty at the start of the race for cutting off the BMW Oracle Team and a tactical error on the final tack to the mark. As you can see from the photo below, this is not your father’s typical racing boat design. This space age, behemoth, multihull has come a long way since the Stars and Stripes win in 1987 with Captain Dennis Connors at the helm. Stars and Stripes was a simple, straight forward’ sloop design. The America’s Cup is a trophy awarded to the winner of the America’s Cup sailing regatta match, and the oldest active trophy in international sport, predating the Modern Olympics by 45 years. Originally named the Royal Yacht Squadron Cup, it became known as the “America’s Cup” after the first yacht to win the trophy, the schooner America. The trophy remained in the hands of the New York Yacht Club (NYYC) from 1857 (when the syndicate that won the Cup donated the trophy to the club) until 1983 when the Cup was won by the Royal Perth Yacht Club, with their yacht, Australia II, ending the longest winning streak in the history of sport. The America’s Cup regatta is a challenge-driven series of match races between two yachts which is governed by the Deed of Gift which was the instrument used to convey the cup to the New York Yacht Club. Any yacht club that meets the requirements specified in the Deed of Gift has the right to challenge the yacht club that holds the Cup. 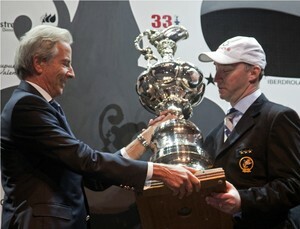 If the challenging yacht club wins the match, the cup’s ownership is transferred to that yacht club. In 1851 Commodore John Cox Stevens, a charter member of the fledgling New York Yacht Club (NYYC) formed a six-person syndicate to build a yacht with intention of taking her to England and making some money competing in yachting regattas and match races. 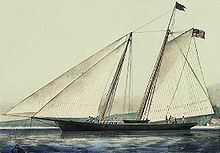 The syndicate contracted with pilot-boat designer George Steers for a 101 ft schooner which was christened America and launched on May 3, 1851. On August 22, 1851, the America raced against 15 yachts of the Royal Yacht Squadron in the Club’s annual 53 mile regatta around the Isle of Wight. America won, finishing 8 minutes ahead of the closest yacht. Queen Victoria, who was watching at the finish line, asked who was second; the famous answer being: “Ah, Your Majesty, there is no second. The surviving members of the America syndicate donated the Cup via a Deed of Gift to the NYYC on July 8, 1857, specifying that it be held in trust as a perpetual challenge trophy to promote friendly competition among nations. The National Oceanic and Atmospheric Administration (NOAA) has extended through February 23 the North Atlantic right whale Dynamic Management Area (DMA) in the vicinity of Ponce Inlet, Florida. Mariners should avoid this area if possible, or transit at 10 knots or less. Click here for a map of the area (PDF).